When I was eleven I wrote a novel. It was round 1972 – my last year at Primary School in Auckland, New Zealand… and I wrote this novel… To Dance Your Life Away. Surprisingly, or unsurprisingly, it has many of the elements, themes, interests that I still engage with in my work. 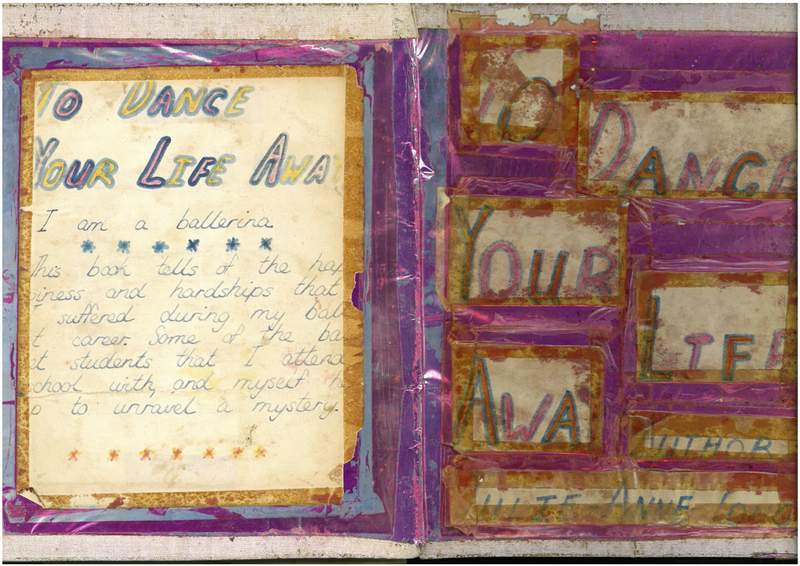 In the tradition of the English ballet school series of novels, Veronica at the Wells and Arthur Hailey’s Airport this cellophane covered exercise book was filled with dreams and aspirations. To Dance Your Life Away was in small part real and in greater slices vividly imagined. A story incorporating my great loves of the time: ballet and large airplanes. It begins with a flashback to my early years – my trip from NZ to England – glamorous 60s style international air travel, which involved a hijacking and the plane being diverted to Cuba. The main focus of the book was my training and dancing on stage at ‘Convent (sic) Garden’. Of course, the plot also involved me stepping out of my understudy’s shoes in a last minute replacement of the prima ballerina after she ‘accidentally fell’ down the stairs and also included a detailed synopsis of the ballet Coppelia – the play within the play/a ballet within the story of ‘the dance’. I laboured hard over this exercise book and included copious drawings traced from my Princess Tina Ballet Books – these books linked dancing and writing for me from an early age. I pored over descriptions of UK Regional Dance Companies performing Cinderella and Sri Lankan, Bharatanatyam child prodigy, Anadavalli (who ironically is actually a close friend of mine in Sydney now). Princess Tina Ballet Books opened up a world of dance that was unfamiliar to me. The reality of the dancers’ life was alluded to and the fantasy of the little girls’ dream was stimulated. Here I am, more than forty years later, still pursuing projects with collisions between fact and fiction. Over the past twelve years I have been making solo dance performance work utilising myself, and my body, as the raw material. I inevitably construct characters, which are firmly connected with the everyday but always larger-than-life. The persona is a composite of reality and artifice. All of which can be traced back to To Dance Your Life Away, my very first novel.